This interview was given by Bruce Gabrielson as part of the Larry Stevenson-Makaha Skateboard Documentary in August, 2003. Very few people probably know about the influence Larry Stevenson and Makaha Skateboards had on the surfboarding industry in Huntington Beach. Most of the world thinks Hermosa and Huntington sort of evolved into the shortboard era independently, but this isn’t quite true. There really was a direct link between the two bastions of surfing. I can’t remember when I first started skateboarding. I do remember pulling apart my steel wheel roller skates and then pounding the top edges flat and nailing them to each end of a board when I was little. I would guess my first serious experiences with skateboards started about 1965 or 66 on the sidewalks in Huntington Beach. I was one of the Pier locals competing in contests on a regular basis by then and skateboarding was a great way to sidewalk surf when there wasn’t any real surf. I had to be careful and not hit any rocks as I remember a few serious scrapes after getting to radical on my skateboard. The hard wheels didn’t handle rocks well. My younger brother Carl really got into skateboards early on and he was performing all the tricks like jumping over chairs, doing 360s, hand-stands, and other crazy things on his boards. 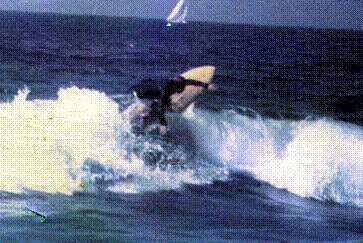 In 1969 I opened Wave Trek Surfboards in Huntington Beach. I was heavily influenced by Dewey Weber and how he promoted his boards with a surf team, so a decision I made early on was to concentrate on the promoting my boards using top competitors rather then marketing through magazines. This strategy led me to finding the best surfers in each age group to represent Wave Trek. The best I could find in boys division was a little guy named Rusty Henderson. His style was very aggressive, well beyond what most other kids in his age were doing. Rusty (right) spent a lot of time around Huntington, virtually every day during the summers, and it wasn’t long before he had a huge local following. Rusty’s had a strong background in skateboarding, so many locals got serious about their skateboarding, including the rest of the Wave Trek team from his enthusiasm. It also wasn’t long before another Makaha skateboarder and top surfer, Ty Page, joined the Wave Trek team. I would say these two helped Wave Trek develop shortboards capable of doing practically everything on the face of a wave. With all the interest in skateboarding, Wave Trek was destined to get into the skateboard business. 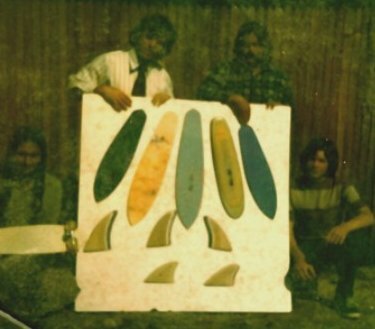 Right from the beginning we were making our own laminated fins plus we started promoting skateboards for our team riders to improve their skills. How we got into manufacturing skateboards was an interesting offshoot. We brought in a very talented laminator and businessman to make the fins named Chuck DelRio. 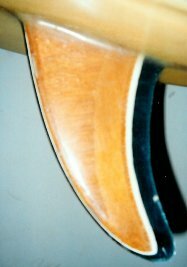 I have to give Chuck all of the credit as he basically grew that part of the business very quickly until we became a large-scale fin supplier for many other shops in Southern California. When Oak Street in Laguna Beach started selling the new nylon wheels and modern trucks to manufacturers in 1973, one of Chuck’s first ideas was that he could make high performance flexible laminated skateboards easier and quicker then fins. Working with our skateboarders, Chuck was a real guru at figuring out just how many layers of cloth would produce the flex we needed for a good skateboard. Under the name TripStix, the Wave Trek facility in Huntington Beach became the first local Orange County board company to manufacture and sell laminated skateboards on a large scale. We started making considerable extra cash by selling skateboards at the Orange County Fairgrounds Swap Meet in the mid-70s. By then my brother had become a tremendous skateboarder. To pull in business, we would tape off the area in front of our table and he would put on a show for the passers-by. Also, by then virtually all the Wave Trek Team members were extensively using skateboards as part of their competition training and several often participated in the shows when the surf was poor. 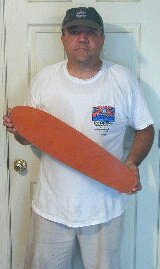 Chuck DelRio promoted and ran the skateboard and glass fin manufacturing operation for several years before the business was finally split off and sold. Looking back on my Wave Trek and TripStix experiences, I would have to say that Larry Stevenson and the Makaha skateboarders had a significant influence on the evolution of the shortboard that took place in Huntington Beach during the 60s and 70s. Larry Stevenson is the father of the modern day skateboard and if it wasn't for him we wouldn't have the Multi-Billion dollar world wide skateboarding industry that we have today. And champions like Tony Hawk wouldn't be where they are today. The industry owes Larry a giant debt of gratitude. He was and still is the man that made it all happen.